See O0470 : Tara Mines train, Duleek. The same train from the other side of the bridge as it heads towards Navan. This one shows the lids used to stop the loss of ore from the wagons. Opened, in sections, by four railway companies between 1850 and 1875. Drogheda – Navan closed to passengers in 1958, Navan – Kingscourt in 1947. There are two short branches – to Platin cement factory at Drogheda and the Tara mines at Navan. 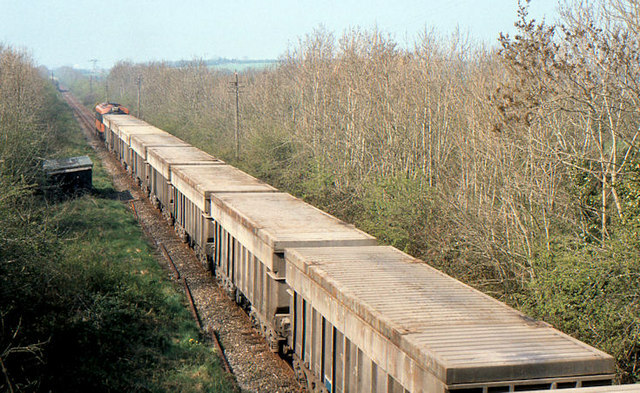 The Navan – Kingscourt section handled gypsum trains until 2001. The line still serves the Tara mines.